As a part of this weekly blog, we wanted to include educational information that will help you get the most out of your horse-riding experience. Having some basic skills down will greatly improve your riding ability and you will have a lot more fun on your rides. This post will be the first in a series about riding tips. Riding horses can take on all kinds of purposes and forms of competition. In years past, the primary purpose was that of transportation and carrying out certain jobs or daily tasks such as: going into battle, rounding up cattle, delivering the mail, running errands, or getting yourself and family to a social function. With the invention of the automobile and other forms of motorized transportation, riding for these purposes was replaced by faster, more convenient means. 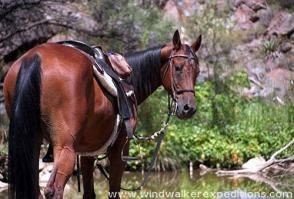 But, the pure enjoyment of being on a horse and the sense of adventure that goes with it remains to this day. The bottom line remains the same, however. When you ride a horse your ‘purpose’ is to move forward on that horse, to get from point A to point B. The tips below will help to make you a better rider. Riding is the art of communicating to the horse your desire to go from point A to point B, and how to do it. This applies whether you are trail riding, jumping a fence, reining, roping, or playing polo: you need to communicate to your horse what you want to do. It is a little bit like a negotiation: there is a connection between the horse and the rider, trust must be established, and the horse has to recognize your commands and then follow. The rider must also trust the horse to keep his footing and not to throw him or her off! A good instructor can advance your skills at riding by teaching you the “language” of communicating with your horse. Balance: the ability of the rider to be carried by the horse without falling off or interfering with the horse’s center of gravity or stability. Feel: the ability of the rider to sense where the horse’s balance will shift to (and why) and anticipate the actions of the horse. Agility: the rider’s ability to stay on the horse whatever its reaction. Pliancy: is the result of the rider’s body going with the movement of the horse. These skills are best learned ON a horse. And the better and more trained the horse, the quicker you will learn. It is easier to learn the art of horse riding on a well-trained horse. Of course, the horse will also need to have been taught the basic language of communication, and our educational post next week will discuss this. Be sure to check back! Update: Check out Horseback Riding Tips: Part II here!